Not exactly my Alma Meter but still! The champions are from my hometown, and my actual Alma Mater is among the winners! 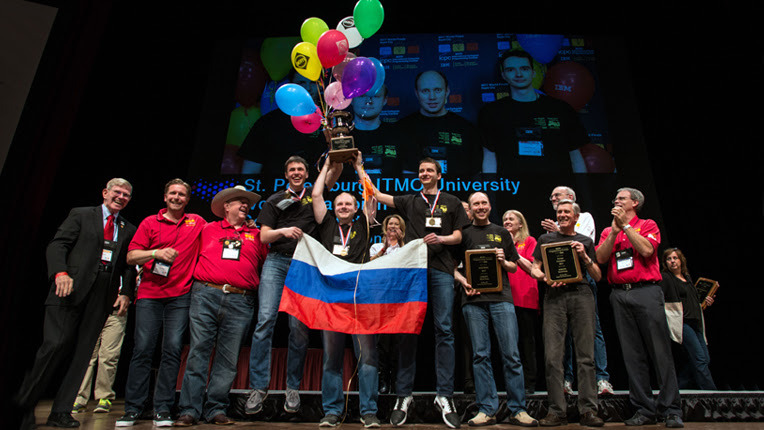 Three students from St. Petersburg University of IT, Mechanics and Optics (ITMO) earned the title of 2017 World Champions in the ACM International Collegiate Programming Contest (ICPC). Teams from University of Warsaw, Seoul National University and St. Petersburg State University finished the competition in second, third and fourth places and were recognized with gold medals in the prestigious competition, which ended today in Rapid City, South Dakota. ACM-ICPC is the premier global programming competition conducted by and for the world’s universities. It is conceived, operated and shepherded by ACM, sponsored by IBM, and headquartered at Baylor University. For more than four decades, the competition has raised the aspirations and performance of generations of the world’s problem solvers in computing sciences and engineering. At ICPC, teams of three students tackle eight or more complex, real-world problems. The students are given a problem statement, and must create a solution within a looming five-hour time limit. The team that solves the most problems in the fewest attempts in the least cumulative time is declared the winner, with the top 12 teams receiving medals. ICPC Regional participation included 46,381 students and faculty in computing disciplines from 2,948 universities in 103 countries on six continents. A record 50,145 students and 5,073 coaches competed in ICPC and ICPC-assisted competitions this year. Full results of the competition are available here. Among other booths of different vendors there was (as usual) the Amazon AWS. And one of their reps told me,that on Thursday they are going to have a “women event”, and whether I want to sign up, and if I just could leave my email with them. I told her: well, there is a conference banquet on Thursday, at what time precisely your event is going to be? And she said reassuringly: after the banquet! I wanted to reach out on behalf of AWS and invite you to attend the AWS Women in Engineering Networking Event tomorrow on Thursday, April 20. Our recruitment and engineering teams are coming down from Seattle for the ICDE Conference and we’d love to meet you in-person at our happy hour at Blue Door Winery in San Diego (around 3 miles from the conference venue). There will be wine tasting, artisanal bites, and a raffle on-site. Please feel free to bring guests, the more the merrier! I am clicking on the invite, and guess what start time it shows? Yes, you are right – at 6PM. In the past couple of months the number of employees in our company have grown significantly. And guess what: almost all of the new employees need access to the Data warehouse! While we were very small, I used to be able (to have time) to explain each new person, how our Data warehouse is organized, how it is being populated, how data is refreshed, and what you should and should not do. But recently I barely could memorize the names of new employees! And when I overheard one of myexperienced co-workers asking one of the new co-workers: do you know how to join tables?… I’ve realized I owe them some education. So, last Thursday I gave a presentation about our data warehouse, and it was a big success – for many folks it was the first time realizing “how this thing works”. But un-doubtfully the most popular one was the last slide: what not to do with your database. Since I think those statements are largely universial, I am going to paste here the contents of the last slide. Although you can’t write anything to the Data Warehouse there are plenty of ways to crush the system, so use caution. Do not use temporal tables. Do not create objects in the public schema. 3. Why not to create objects in the public schema? Well, because it’s public! Because anybody can create tables in the public schema! And everybody create tables owned by them, which other people can’t access. The public schema should only hold the publicly used functions and such. I think, the rest is self-explanatory! Yesterday was a Day – a day when Joe Conway presented at Chicago PUG. He was talking about the PL/R extension of Postgres, which is really important for out data analysts. May PUG with Joe Conway! I neglected to advertise our May event, and this is going to be indeed the most interesting meetup of 2017! Because just in two days, on May 19 Joe Conway will be speaking at Chicago PUG. I definitely do not need to advertise him, but I am advertising the fact of his appearance in Chicago, and encourage everybody to attend. Please RSVP at our Meetup page, and hope to see there.